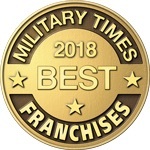 At DreamMaker® Bath and Kitchen, we’re honored to have been named among the best franchises for veterans by Military Times. The publication considered franchises all across the country and ranked them based on culture, performance, costs and support offered to current and former service members and their families. DreamMaker ranked #26 out of 53 franchises on the list. We’re proud that Military Times saw fit to recognize the systems, support and financial opportunity that have helped veterans thrive in civilian life with our franchise. Like the military, DreamMaker is a values-driven organization. That gives us a purpose and a focus, and it encourages our team and our franchisees to not just serve our clients, but to serve our communities. 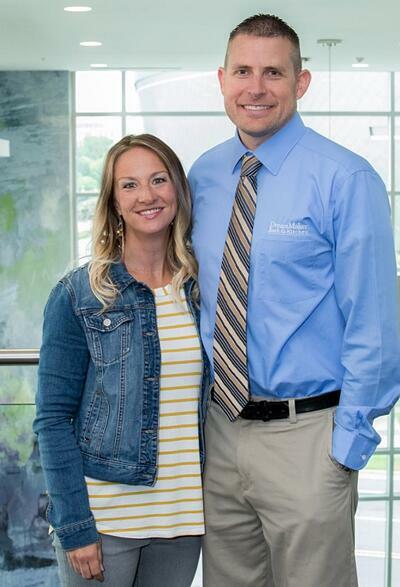 Air Force veteran and Ogden, UT, DreamMaker franchisee Nate Coombs with his wife, Emily. “DreamMaker’s corporate philosophy emphasizes honesty and community service,” says Nate Coombs, a former officer in the U.S. Air Force and co-owner of the DreamMaker franchise in Ogden, UT. Coombs remains dedicated to his community, helping veterans and seniors in his communities enjoy a higher quality of life through kitchen and bath remodels that accommodate their particular needs. Our values and our commitment to veterans are fundamental parts of DreamMaker. DreamMaker’s founder, Don Dwyer, Sr., started the VetFran Program after the Gulf War to help the men and women who so selflessly serve our country. Today, the VetFran program helps veterans across the country become business owners through franchising. DreamMaker Bath and Kitchen is proud to offer our service members and veterans a $5,000 discount on their franchise fee.